GENERAL DESCRIPTION FOUR OUTSTANDING HIGH QUALITY SPACIOUS NEW MODERN GROUND FLOOR APARTMENTS ** TWO DOUBLE BEDROOMS (ONE with EN SUITE SHOWER ROOM) ** PRESTIGIOUS PRIVATE RESIDENTIAL COURTYARD DEVELOPMENT ** GENEROUSLY PROPORTIONED ACCOMMODATION of OVER 625 sq.ft. ** LARGE LIVING ROOM either BAY FRONTED or with JULIET BALCONY ** OPEN PLAN to MODERN FITTED KITCHEN with DISHWASHER, WASHER / DRYER, FRIDGE / FREEZER, FAN ASSISTED OVEN, CERAMIC HOB & VENTED EXTRACTOR HOOD ** LARGE MODERN WHITE BATHROOM with MAINS SHOWER over Bath ** DOUBLE GLAZING ** ELECTRIC PANEL HEATING ** DESIGNATED & VISITOR PARKING ** OPTIONAL TANDEM CAR PORTS ** RECREATIONAL SUN TERRACE ** DRYING ROOM ** CYCLE STORE ** BIN STORE ** WOODED OUTLOOK over FARSLEY BECK VALE ** LONG DISTANCE AIRE VALLEY VIEWS ** CUL DE SAC LOCATION ** CONVENIENT for LOCAL AMENITIES & TRAVEL to LEEDS & BRADFORD ** NO CHAIN SALE. These spacious and select prestige apartments will be of particular interest to discerning professional and mature couples seeking superior accommodation is a secluded yet convenient private residential development with the highest quality specifications for the ultimate in comfort, convenience and peace of mind. 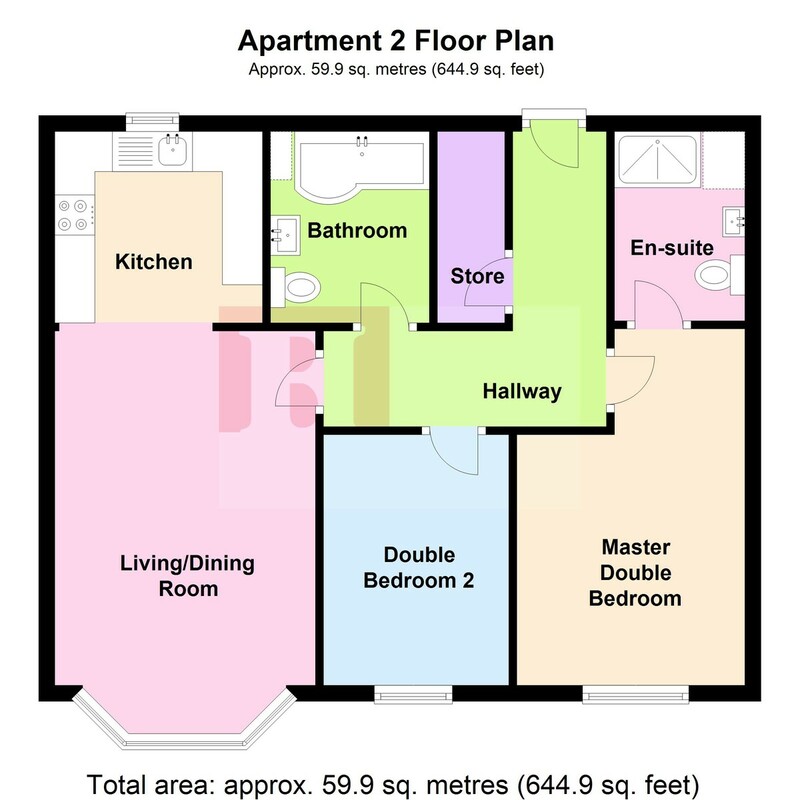 ROOM DIMENSIONS, PHOTOGRAPHS AND OPTIONS All four apartments are approximately the same size and layout (two are ‘mirror images’) – please refer to the floor plan for apartment 2 on page 12. The room sizes quoted should not be relied upon as precise sizes for each of the individual apartments, but do accurately represent the proportions of the rooms in all four apartments. The interior photographs are of other apartments in the development with the same layout and dimensions and are for information purposes only. Purchasers will have the opportunity to specify their kitchen design preferences from the Howdens’ range (upgrades from those shown are available at additional cost), bathroom and shower room wet wall panelling, flooring and neutral decoration throughout. APARTMENT PRICES Apartment 1 (square bay window to the mid-front) – £129,999. Apartment 2 (hexagonal bay window to the corner front) – £124,999. Apartment 3 (juliet balcony to the corner rear) – £149,999. Apartment 4 (juliet balcony to the mid-rear) – £139,999. ENTRANCE HALL 12′ 5" x 4′ 0" (3.78m x 1.22m) Howdens’ ‘Dordogne smooth’ gardenia cream coloured ribbed apartment entrance door with spy hole. Individually programmable electric wall panel heater. Door entry phone. Hard wired smoke alarm. Large walk-in illuminated storeroom (8’0" x 2’4") housing large 210 litre unvented pressurised hot water cylinder. Neutral decor. Mounded door architraves. Choice of flooring. Gardenia cream coloured ribbed doors to master double bedroom and storeroom. Open plan to inner hall. LIVING / DINING ROOM 14′ 7" x 10′ 9" (4.44m x 3.28m) max White uPVC double glazed bay window to front. Area for dining table and chairs. Individually programmable electric wall panel heater. Cable / TV aerial points. Neutral decor. Choice of flooring. Gardenia cream coloured ribbed door to inner hall. Open plan to kitchen. N.B. the dimensions quoted are for apartments 3 and 4 with patio doors and full height side lights to juliet balcony; the apartments with bay windows measure 17’0" x 11’1" max. (apartment 1 – square bay window) and 16’6" x 10’9" max. (apartment 2 – hexagonal bay window); please refer to the floor plan for apartment 2 on page 12. OPEN PLAN KITCHEN 8′ 6" x 8′ 0" (2.59m x 2.44m) Choice of modern fitted ‘Howdens’ kitchen including drawers and pan drawer; wine rack; moulded pelmets; soft closure to doors and drawers. Choice of round edged worktops and matching upstands. Black ceramic four ring electric hob with brushed stainless steel splashback and extractor and light over in feature brushed stainless steel canopy hood. Stainless steel electric fan assisted oven. Automatic washer dryer. Automatic dishwasher. Upright fridge freezer. Neutral decor. Choice of vinyl flooring. Open plan to living / dining room. INNER HALLWAY 7′ 5" x 3′ 11" (2.26m x 1.19m) Individually programmable electric wall panel heater. Neutral decor. Choice of flooring. Open plan to entrance hall. Gardenia cream coloured ribbed doors to living / dining room, second double bedroom and bathroom with moulded architraves. MASTER DOUBLE BEDROOM 14′ 7" x 9′ 0" (4.44m x 2.74m) max White uPVC double glazed window to front. Individually programmable electric wall panel heater. Space for wardrobes and bedroom furniture. Neutral decor. Choice of flooring. Gardenia cream coloured ribbed doors to inner hallway and en suite shower room with moulded architraves. EN SUITE SHOWER ROOM 8” 0" x 5′ 5" (2.44m x 1.65m) max Modern white three piece suite with chromed fittings. Large glazed shower cubicle with optional design wet wall panelling, sliding glazed door and mains shower with twin monsoon and hand held shower heads. . Recessed storage / display shelving. Half inset vanity wash hand basin with monobloc tap, pop-up waste, vanity shelf, splashback and double storage cupboard below. Concealed cistern WC with white seat. Individually programmable electric wall panel heater. Shaver point. Extractor unit. Choice of vinyl flooring. Gardenia cream coloured ribbed door to master bedroom with moulded architraves. DOUBLE BEDROOM 2 10′ 3" x 7′ 8" (3.12m x 2.34m) White uPVC double glazed window to front. Individually programmable electric wall panel heater. Space for wardrobe and bedroom furniture. Neutral decor. Choice of flooring. Gardenia cream coloured ribbed door to hallway with moulded architraves. BATHROOM 8′ 0" x 6′ 7" (2.44m x 2.01m) max Modern white three piece bathroom suite with chromed fittings. Panelled ‘L’ bath with mixer tap, pop-up waste, mains shower over with twin monsoon and hand held shower heads, glazed shower screen with fitted chromed towel rail and choice of wet wall panelling. Half inset vanity wash hand basin with monobloc tap, pop-up waste, vanity shelf, splashback and double storage cupboard below. Concealed cistern WC with white seat. Individually programmable electric wall panel heater. Shaver point. Extractor unit. Neutral decor. Choice of vinyl flooring. Gardenia cream coloured ribbed door to hallway with moulded architraves. COMMUNAL ENTRANCE HALL AND CORRIDOR Double glazed communal entrance door with digital push button residents’ entry and door entry phone to individual apartments. CCTV camera. Courtesy lighting. 2’9" (0.84m) wide fire doors with security glazed lights leading to inner communal corridor. Internal lower ground floor corridor and staircase for access from parking / car ports / sun terrace / drying room / bicycle store. EXTERIOR The private residential courtyard development is situated in a head of cul de sac location adjacent to Farsley Beck Vale with a wooded outlook and a long distance view towards the Aire valley. The gated tarmac entrance road leads across the front of the building (with disabled access) and proceeds around to the rear of the building where there is a brindled block paved shared car park with designated resident and visitor parking areas. There are nine tandem double car ports available for rental or purchase (prices to be confirmed). Blue badge disabled disc holders may have a parking area designated and delineated at the front of the building. A shared paved recreational sun terrace is located to the south of the grounds at the rear with a south westerly aspect for afternoon and evening sun. THE DEVELOPERS D A Diston Builders have been offering contractor and joinery services throughout Yorkshire for over 30 years. A friendly family firm of craftsmen, builders, joiners and contractors from the Leeds area, David and his team deliver top quality building projects across the whole of Yorkshire and pride themselves on meeting their clients’ every requirement. Their range of services include a qualified and experienced workforce with the tools, plant and equipment to complete the project in hand; the experience to work with Architects, Building Inspectors, Structural Engineers and other trades; the assurance that comes from being recommended – most of their work comes from customer referrals; and the knowledge and experience to develop a client’s own ideas and turn them into reality. HIGH QUALITY FEATURES AND SPECIFICATIONS Superior construction, soundproofing, insulation and facilities. Choice of ‘Howdens’ kitchens, showers and neutral decoration (with optional upgrades). Individually programmable electric wall panel room heating. Large 210 litre unvented pressurised hot water cylinder. White uPVC double glazing. Twelve camera CCTV security system accessible by iPhone or Android app. Digital coded keypad entry and audio door entry telephone. Terrestrial TV, ‘Virgin’ cable TV and broadband internet connections. USB socket. Water meter. High 8’3" (2.52m) ceilings. Disabled access and wide doors. ‘SuDS’ sustainable drainage and flood proofing system. Howdens' 'Dordogne smooth' gardenia cream coloured ribbed apartment entrance door with spy hole. Individually programmable electric wall panel heater. Door entry phone. Hard wired smoke alarm. Large walk-in illuminated storeroom (8'0" x 2'4") housing large 210 litre unvented pressurised hot water cylinder. Neutral decor. Mounded door architraves. Choice of flooring. Gardenia cream coloured ribbed doors to master double bedroom and storeroom. Open plan to inner hall. White uPVC double glazed bay window to front. Area for dining table and chairs. Individually programmable electric wall panel heater. Cable / TV aerial points. Neutral decor. Choice of flooring. Gardenia cream coloured ribbed door to inner hall. Open plan to kitchen. N.B. the dimensions quoted are for apartments 3 and 4 with patio doors and full height side lights to juliet balcony; the apartments with bay windows measure 17'0" x 11'1" max. (apartment 1 - square bay window) and 16'6" x 10'9" max. (apartment 2 - hexagonal bay window); please refer to the floor plan for apartment 2 on page 12. Choice of modern fitted 'Howdens' kitchen including drawers and pan drawer; wine rack; moulded pelmets; soft closure to doors and drawers. Choice of round edged worktops and matching upstands. Black ceramic four ring electric hob with brushed stainless steel splashback and extractor and light over in feature brushed stainless steel canopy hood. Stainless steel electric fan assisted oven. Automatic washer dryer. Automatic dishwasher. Upright fridge freezer. Neutral decor. Choice of vinyl flooring. Open plan to living / dining room. Individually programmable electric wall panel heater. Neutral decor. Choice of flooring. Open plan to entrance hall. Gardenia cream coloured ribbed doors to living / dining room, second double bedroom and bathroom with moulded architraves. White uPVC double glazed window to front. Individually programmable electric wall panel heater. Space for wardrobes and bedroom furniture. Neutral decor. Choice of flooring. Gardenia cream coloured ribbed doors to inner hallway and en suite shower room with moulded architraves. Modern white three piece suite with chromed fittings. Large glazed shower cubicle with optional design wet wall panelling, sliding glazed door and mains shower with twin monsoon and hand held shower heads. . Recessed storage / display shelving. Half inset vanity wash hand basin with monobloc tap, pop-up waste, vanity shelf, splashback and double storage cupboard below. Concealed cistern WC with white seat. Individually programmable electric wall panel heater. Shaver point. Extractor unit. Choice of vinyl flooring. Gardenia cream coloured ribbed door to master bedroom with moulded architraves. White uPVC double glazed window to front. Individually programmable electric wall panel heater. Space for wardrobe and bedroom furniture. Neutral decor. Choice of flooring. Gardenia cream coloured ribbed door to hallway with moulded architraves. Modern white three piece bathroom suite with chromed fittings. Panelled 'L' bath with mixer tap, pop-up waste, mains shower over with twin monsoon and hand held shower heads, glazed shower screen with fitted chromed towel rail and choice of wet wall panelling. Half inset vanity wash hand basin with monobloc tap, pop-up waste, vanity shelf, splashback and double storage cupboard below. Concealed cistern WC with white seat. Individually programmable electric wall panel heater. Shaver point. Extractor unit. Neutral decor. Choice of vinyl flooring. Gardenia cream coloured ribbed door to hallway with moulded architraves.